They haven’t put NIU’s new 28-foot-long, 2,200-pound robotic submarine in the water yet, but geologists Ross Powell and Reed Scherer have already made a big splash. The submarine, which will be used to explore melting near the base of the West Antarctic Ice Sheet, was a big hit as it was unveiled in mid-December at the American Geophysical Union Fall Meeting in San Francisco, attended by nearly 20,000 scientists, students and members of the media. 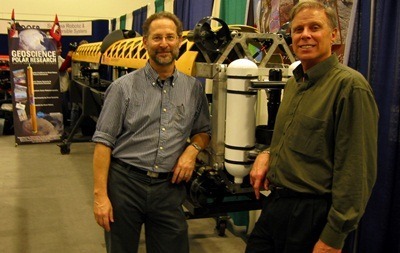 Reed Scherer (left) and Ross Powell in front of the newly built robotic submarine during its San Francisco unveiling. The San Francisco Chronicle featured the submarine and the NIU scientists on the newspaper’s Dec. 20 front page. Other media outlets picking up on the story included Discovery News, Live Science, Earth Magazine online and msnbc.com. “The NIU Department of Geology and Environmental Geosciences was prominently represented at the conference,” said Powell, an NIU Board of Trustees Professor. DOER Marine, a robotics engineering firm located in the San Francisco Bay area, spent nearly three years building the unmanned yellow submarine for NIU. It is equipped with five cameras, a water sampler, a sediment corer, a Doppler current meter, more than two dozen sensors, a laser-beam for measuring objects, a robotic arm with “fingers” for gathering samples, a device for imaging and mapping the seafloor surface, an acoustic sounder for profiling sub-seafloor sediment and numerous other instruments. Powell, Scherer and a team of researchers from other institutions will drill through more than a half mile of ice and lower the submarine — which can collapse to a width of just 22 inches in diameter — through a 30-inch-wide ice borehole into the ocean water beneath the Ross Ice Shelf adjacent to the West Antarctic Ice Sheet. About two miles of cable will tether the submarine to a control center on the ice, where images and data will be collected. The robotic submarine will allow scientists for the first time ever to observe melting and other conditions at the interface between seawater and the base of the glacial ice. Scientists also will use the submarine to investigate the sea floor and layers of sediment beneath. 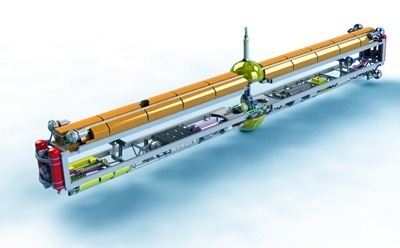 The National Science Foundation-supported project is scheduled for late 2013, but the submarine will be tested in late March at Lake Tahoe and at the end of 2011 near McMurdo Station, the United States’ main base in Antarctica. The dive at Lake Tahoe, one of the world’s deepest freshwater lakes, is designed to test the extensive instrumentation on the submarine and gather information on fault lines beneath the lake.